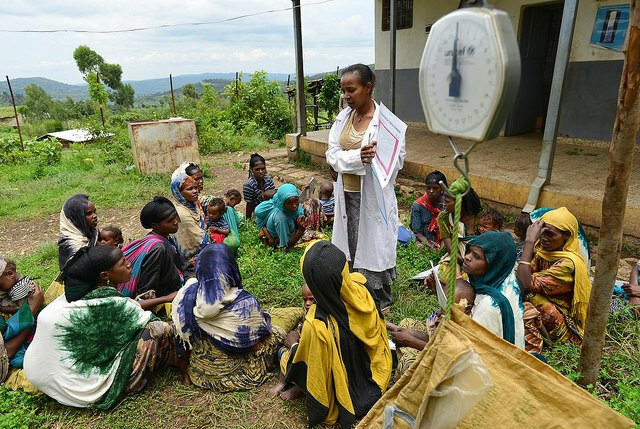 Has Ethiopia really achieved the MDG? On Sept.13, the BBC World Service aired the first segment of a two-part documentary entitled: Africa Surprising. As part of the series, journalist Hugh Sykes reported thatEthiopia has achieved a number of Millennium Development Goals (MDGs) ahead of schedule. Unfortunately, the report illustrates the Western media’s sloppy and superficial coverage of African success stories. At least in Ethiopia, the much-celebrated storyline does not actually exist on the ground. The most central and relevant part of the broadcast is Sykes’ visit to a health center in Ethiopia’s capital, Addis Ababa. It is unclear how the BBC chose to profile this particular site, but Ethiopians know that such matters are typically handled by the regime. Authorities pick a site, tidy up everything and then let unsuspecting visitors or journalists such as Sykes in at their own convenience. As Sykes walked around the clinic, he noticed that the doctors and nurses greeted him with “broad smiles.” Their exuberance looked too unreal that Sykes had to ask why they were smiling so much. “They were so happy for over achieving the MDGs ahead of time,” a health staffer murmured. Of course, they had to smile, how else could they keep their jobs and a straight face while talking about a barely existent achievement? It is startling that an astute journalist like Sykes was not aware that the whole thing was a setup. Ethiopia’s success stories are often created by manufacturing data or instructing project managers on how to provide information to foreign journalists. (In the case of journalists at the state-run media, reporters are given instructions on how to tell such stories.) In the BBC documentary, the clinic’s staffers appear a bit overzealous to the point of making Sykes uncomfortable. He asks what exactly they did to reach their targets ahead of schedule. Among other things, they recounted their work educating families on the benefits of breastfeeding and family planning. Incidentally, one of Ethiopia’s MDG success stories is the reduction of birth rates through a “highly successful and exemplary family planning” scheme. Little do reporters like Sykes or novice Western researchers know that the decrease in birth rate has nothing to do with the government’s family planning but the excessive outmigration of large cohorts of young women to the Middle East and South Africa, among other places. Importantly, the excessive outmigration of Ethiopia’s youth is a reflection of dire poverty, and failure to achieve the MDGs. This outflow has intensified since the MDGs were put in place. Despite this, Sykes seems to nod, admire and move on. “Over the last ten years we achieved more than what was achieved during the previous century,” Ethiopia’s Minister of Health, told Skyes, an audacious and superfluous claim that the journalist let stand. The series wrapped up by paying lip service to the truth: Sykes showed high rise buildings within a few meters of slums with shabby dwellings, rusty tin roofs and muddy walls; executives with stylish modern suits walking on the same streets with bony beggars; SUVs shuffling along with donkeys and goats on the streets, etc. He then offered a faint reference to ruling party’s embarrassing declaration of 100 percent electoral victory in May, alluding to a familiar storyline — Ethiopia’s economic rise despite a few governance hiccups here and there. The regime in Addis Ababa has ridden Ethiopia of educated manpower so much that the capacity to put numbers together and generate sensible economic statistics and estimate reasonable economic growth rates has been grossly diminished over the years. This is not a place to delve into the niceties of GDP estimation and growth rate calculations. By government’s own admission, almost all of the last five-year Growth and Transformation Plan (GTP I) targets have not been achieved, with all large infrastructural projects stuck at their early phases. However, the GDP growth rates remained more or less at the level forecast at the plan’s preparation stage. If all economic activities have not reached their goals as planned (in fact most lagged behind anticipated targets), how did Ethiopia somehow manage toachieve only the MDG targets, before schedule at that? The distribution of income and wealth are aspects of economic progress that are most relevant to the MDGs. The widening gulf between the haves and have-nots in Ethiopia does not require a journalist or any analyst to leave Addis Ababa. The alarming increase in the number of beggars in the streets and the exodus of unemployed youth across deserts and high seas are sufficient to inform any observer interested in arriving at a balanced assessment. But such a story may not generate enough clicks in donor countries. It may also undercut the Western narrative of saviordom that’s driven by the aid-industrial complex. Why are donor countries and their institutions so keen to tell the “Ethiopia rising” story to the extent of getting ordinary Ethiopians irritated and uncomfortable? It is appropriate to provide a broader background on the origins of the MDGs. Back in the 1980s, African governments were told to adjust their economies to market rules through structural adjustment programs (SAPs). There was little to no concern with “poverty” in the West. Laissez-faire economics or economic policy based on market rules was the order of the day. By mid-1990s, the failure of SAPs became apparent, primarily because they gave rise to widening gaps in income distribution and propagation of poverty, particularly in Sub-Saharan Africa. The International Monetary Fund and the World Bank, who promoted SAPs, were at one point even referred to as Lords of Poverty. However, rich western nations were behind these multilateral agencies, arm-twisting leaders of developing countries to adjust their economies to the needs to the “global economy,” a proxy for the economies of the industrialized countries. Western powers and their multilateral agencies reluctantly acknowledged the failure of laissez-faire economic policies and replaced them with the MDGs amid pressure from their progressive constituents, presumably to redress the damage caused to the developing countries’ economies. MDGs were grouped into sets of eight targets and handed over to developing countries with a condition that development aid would be strictly linked to achievements of the MDGs. When the MDGs came into existence, Ethiopia’s current rulers had already been in power for more than ten years. The regime immediately became a darling of the West because of massive poverty, which led to the outpouring of a substantial amount of development aid over the last two decades. The coupling of development aid with the achievement of MDGs target has created a precondition and breeding ground for misreporting on achievements of those targets.In dictatorial regimes like Ethiopia, numbers related to achievements can easily get churned out and systematically built over the years. It is often hoped that donor countries, and the United Nations, which is responsible for monitoring the progress on MDGs, would scrutinize data accuracy and ensure that the targets have genuinely been achieved. That is the ideal scenario, but we live in the real world, not in the ideal world. In the real world, the required level of scrutiny does not often come into existence simply because it is costly to setup and operationalize them. To begin with, donors often assign inexperienced and naïve staff with skills unfit for the purpose of managing large and complex programs and projects. Additionally, donor agencies and NGOs have a responsibility to report back to their governments or fund providers on implementations of programs they are entrusted with. Therefore, it is not in the interest of such agencies to report program or project failures. The Ethiopian regime has often presented itself as a key partner with the Western powers. Geopolitical interest and the excessive weight assigned to security concerns mean authorities in Addis Ababa could do anything and get away with it. This has adversely affected scrutiny on MDGs progress. No analyst or reporter would dare to question records supplied by officials in Addis Ababa. A journalist or researcher, who tries to shed some doubt on the credibility of official statistics, would be harshly treated, including expulsion with short notice or even physical attacks. It is also abundantly clear that there is a tacit understanding between the Ethiopian government and the donor agencies not to scrutinize Ethiopia’s record on MDGs to a required extent. Donors need a foreign aid success story. Besides, for fear of political backlash from the general public, Western leaders would not object to the success story lines. It is in this scheme of things that the Western media appear to be given the role of generating the “Ethiopia rising” or “Africa Rising” storylines to enhance the “feel good factor” in donor countries. The increasingly muzzled Ethiopian public can do little more than helplessly watching this drama being played out in the name of poverty reduction.